I used an Art Journal Adventure prompt for this art journal page. The idea had been to use household objects for mark-making. 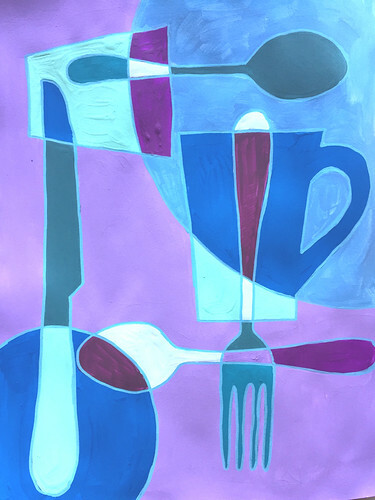 I decided, however, to make an abstract piece by drawing around various kitchen utensils, overlapping the silhouettes, and then (very roughly) filling the resulting shapes in with acrylic paint. It was just the type of quick dose of art I needed on a busy day. My art table is in the kitchen so I was able to create this page while cooking and cleaning in the same space. It’s rough and ready but it was a fun stress-buster to just throw some paint around on paper. Laura, what a great idea and I love the abstract arrangement. The outline around the utensils is brilliant. Thanks, Sharon. I like the idea but my execution was sloppy and rough. I might give the page another, neater coat of paint when I have more time. Except I probably won’t because I’ll have moved onto the next thing and left this page far behind. This is a keeper. Great idea and beautiful. Abstract and real. At one time. Thanks. I’ve never been able to do anything properly abstract but using a little bit of abstraction can be fun. I think you are better at it than you think. Love the arrangement and the colors! Good job! Thank you. My painting was pretty sloppy but I like the concept. I enjoyed the loose-ness of it. If it had been “too neat” it would have read as merely a “graphic design”. As it is it has more life! Will you do more in this vein? Hope so…. I think so. In some ways it feels connected to some of those patchwork landscapes I’ve dabbled in. Maybe that’s my way of handling subjects I’m not inherently drawn to. I thought I saw a connection to your past landscapes. Glad to hear you may do more! Isn’t it fun to dabble in art genres you’re not typically drawn to? My recent still lifes have stretched my own thinking (still life wasn’t a genre I was initially drawn to)… and I’m now thinking about visual stories, my animal characters and handling them differently (somewhat). We’ll see what happens. I think people would put that on their kitchen walls. Thank you! I think I’ll try a more polished version at some stage. Great colours combination and beautiful layout! Love this!